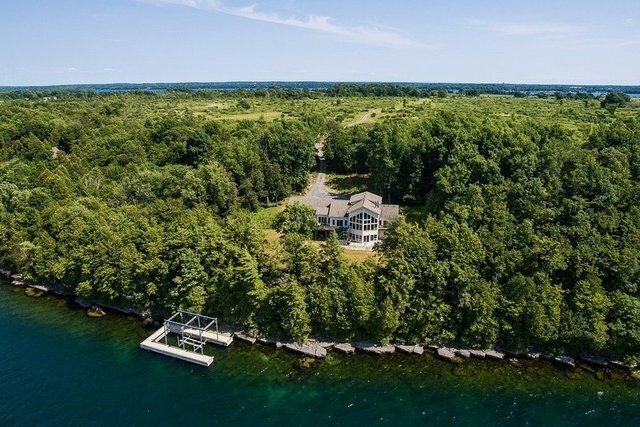 Wonderful Wolfe Island living combines the best of home & vacation on 38.6 acres with 490 feet of Lake Ontario waterfront with 45` x 16`5 steel & concrete dock with hardwired electric lift. Approx 8 years old with NEW propane furnace Sept/17. 4 Bedroom 3 Bath home with gorgeous maple flooring throughout main level and Loft. Soaring ceilings and open concept living with 2 stunning stone fireplaces for those Autumn & Winter evenings. Large, bright maple Kitchen with built-in appliances, centre island plus a breakfast bar overlooking the Dining Room. (new counters arranged) Sunroom flows to a large upper level deck and the Main Level Master Suite has a private deck, both with scenic waterfront vistas. Lower level has a massive Rec Room that opens to an awesome bar and amazing wine cellar as well as a separate Family room and private bed & bath. There is an attached Double Car Garage plus a 38` x 27` Quonset hut. 365 day Ferry from Kingston, ON and a 3 season Ferry from New York State so access is simple & easy making the local Kingston amenities such as fine dining, theatre, shopping and medical care/hospitals mere steps away!